Roll basil leaves and cut into strips. 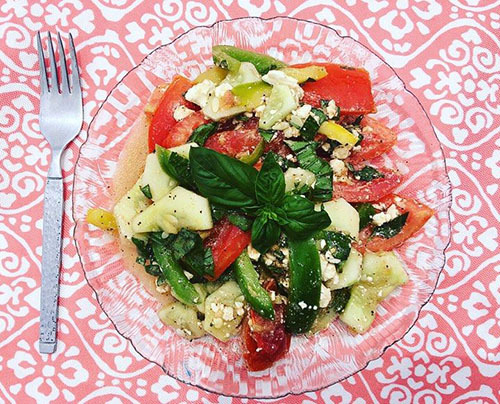 In a large mixing bowl, combine basil, tomatoes, cucumber, bell pepper, and feta. In a small bowl whisk together the olive oil and coconut water vinegar. Drizzle dressing, add salt and pepper, and toss salad. Raw Coconut Water Vinegar. Buy it here! Tropical Traditions Organic Coconut Water Vinegar is truly unique and is the first of its kind in the US market! Most vinegars are clear because they are distilled and originally made from white sugar. Our Organic Coconut Water Vinegar is not distilled, but raw. It contains the mother of vinegar. In the Philippines most all commercial vinegars are distilled, and the “coconut vinegars” are not made from the nutrient-packed coconut water from inside the coconut, but from the sap of the coconut tree which is used to make lambanog, an alcoholic drink similar to vodka. These “coconut vinegars” are by-products of the lambanog industry. To make these products, one must harvest the sap of the coconut tree from the coconut flower bud, which would normally become a fruit-bearing coconut. Hence, trees dedicated to harvesting the sap for lambanog and the more common coconut vinegar will never produce coconuts. Tropical Traditions does NOT support coconut products that prevent coconut trees from bearing fruit (this would include “coconut sugar” harvested from the flowering bud of the coconut tree.) Coconut trees in the Philippines have been on the decline for decades, and the coconut oil from coconuts is also now valued as a fuel source in bio-diesel production, resulting in less coconut oil availability as a food source each year. Vinegar made from coconut water, however, does not sacrifice coconuts or coconut oil in its production, as it is collected from mature coconuts which are used to make coconut oil, and the same trees can continue producing coconuts year after year. In a large mixing bowl combine all ingredients, except coconut oil and honey, stir well. In a small saucepan melt the coconut oil and honey. Pour over the salad and mix well. Enjoy this as a light lunch or serve as a side with a larger meal. This tangy salad pairs well as a side to go with grilled meats. Recipe and photo by Orissa. 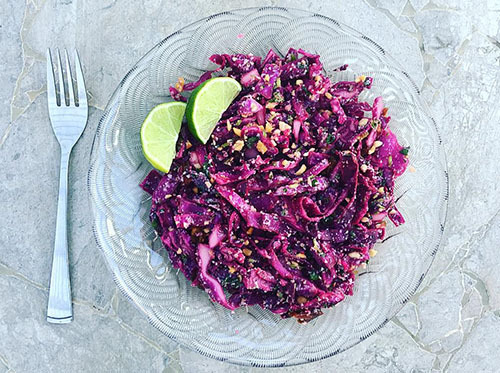 Submit your creative coconut recipes and photos here for a chance to win $50! 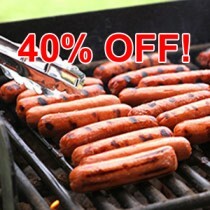 These premium Buffalo Dogs are 100% grass-fed and grass-finished on pasture with small-scale family farmers. Buy them here! Bison is the purest form of red meat in North America, having never been domesticated and cross-fed for feedlots. No hormones, antibiotics or GMO feed! First, make dressing: add coconut oil, coconut milk, garlic, and spices into a small bowl, whisk together. Next, clean, de-stem, and tear kale into bite-sized pieces. 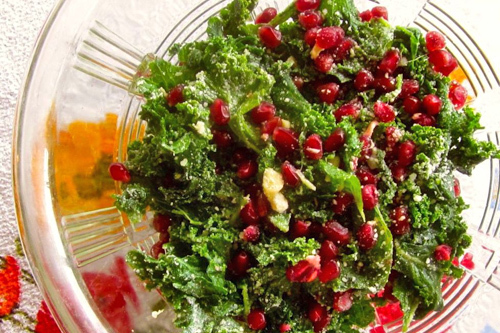 Squeeze ½ lemon, pour juice over kale and sprinkle with sea salt. Pour the prepared dressing over the kale and hand toss until thoroughly covered. Add pomegranate seeds, and sprinkle freshly-grated parmesan cheese on top. Chill for a few hours or enjoy immediately. Other good additions: sliced strawberries, toasted nuts, raisins, pine nuts, freeze-dried blueberries, etc. 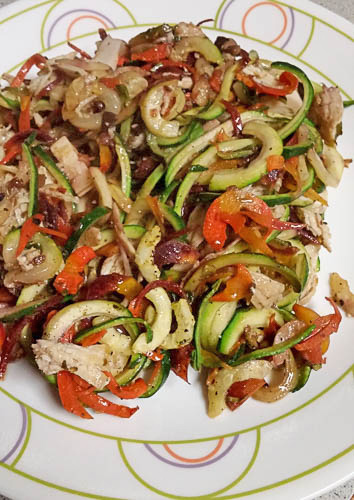 Amy from Milford, NE won $50 for this recipe and photo! Submit your coconut recipes and photos here! In a large skillet, heat coconut oil. Add zucchini, carrots and chicken. Cook for about 10 minutes or until vegetables are slightly soft. Add olives, basil, tomatoes, garlic, salt and pepper. Cook for an additional 5-10 minutes or until heated through and soft. Shred zucchini and place in clean towel and squeeze dry. 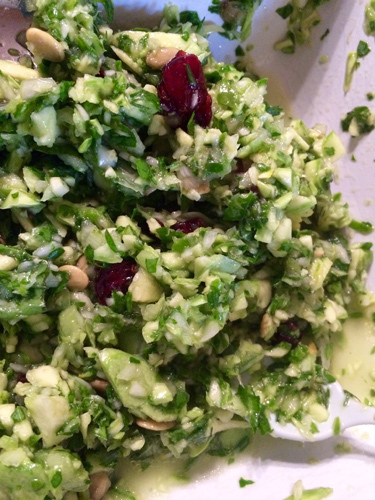 Put zucchini, mint, dill, and green onions in a large bowl. In a small bowl, mix the lemon juice, zest, olive oil, garlic, vinegar, honey, salt and pepper. Combine bowls and then add nuts, cranberries, cheese and lightly toss. If bolder flavors are desired, add more dill, mint, lemon and garlic. Chill in the fridge for several hours or overnight before serving, if desired, to allow flavors to optimize. It is just as tasty when served immediately. Cheryl from Carbondale, IL won $50 for this recipe and photo! Submit yours here! Peel beets and chop into small chunks. 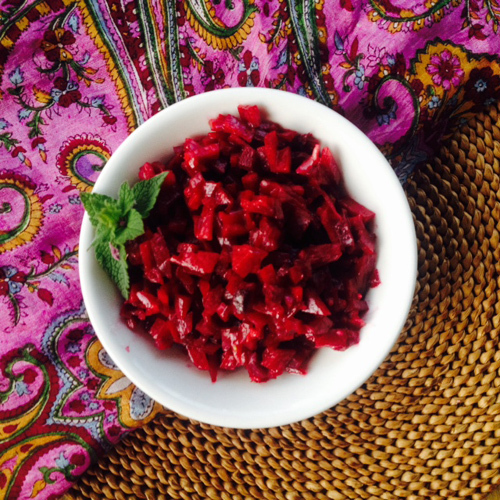 (You can also use a grater or your food processor to chop beets once they are peeled.) Combine coconut oil, salt, cumin, lemon juice, and pressed garlic. Mix dressing thoroughly and combine in a large bowl with chopped beets. Serve room temperature or cold (coconut oil will solidify when cold). In a small saucepan, combine cranberries, water and raw honey. Bring to a boil and let simmer about 10 minutes or until cranberries have popped. In a medium saucepan, combine soaked tapioca, chopped dates, milk, vanilla and sea salt. Cook on low for about 30 minutes or until mixture has thickened. Let tapioca cool completely. 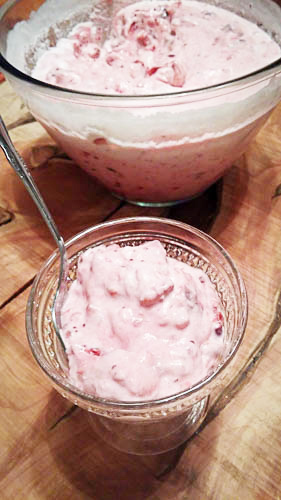 In a glass serving bowl, combine cranberries, tapioca, pecans, bananas and pineapple. Gently toss until mixture is combined. Refrigerate at least 2 hours before serving. Enjoy with additional honey if desired. Rinse chicken and pat dry. Cut the chicken into strips and set aside. Mix coconut flakes and ground almonds together on a dinner plate. In a medium-size bowl, beat the egg. Dip the chicken strips in the egg and roll each strip in the coconut-flax mixture. Heat the oil in a pan and sauté the chicken strips until completely opaque through the center. Sever over a bed of mixed greens with Lemon-Olive Oil Dressing or your favorite vinaigrette.